With a title like that, how can you go wrong? It’s one of the oddest titles I’ve come across. And the story itself matches that oddness, though it doesn’t quite come to fruition, as I would have liked. 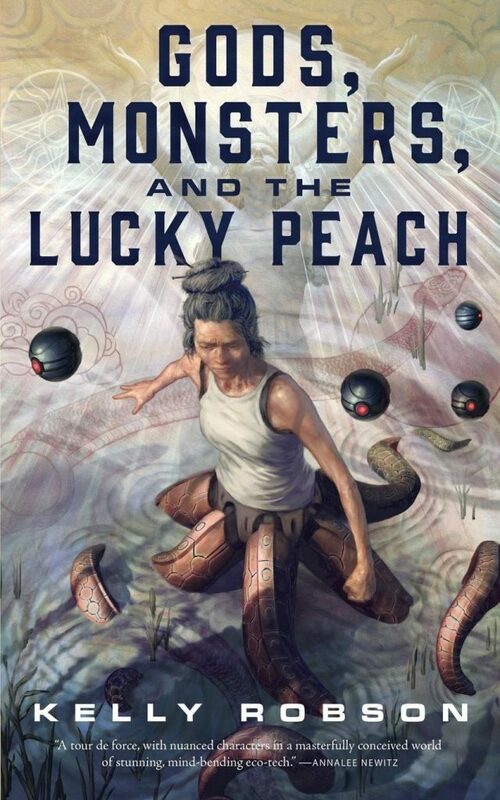 Kelly Robson’s Gods, Monsters, and the Lucky Peach is set in an apocalyptic future, where the earth’s environment has degraded to such an extent that people have been forced underground. At the time of the story, this happened quite some time ago, and only “now” are humans coming back up, thanks to engineers and scientists that engineer whole ecosystems to enable humans to survive on the surface. There are a few such enclaves around the world, such as Calgary, where much of the story centers. The crux of the story is a new opportunity for a small group of scientists to learn about an ancient river system. I won’t say exactly how, but this is where the “lucky peach” comes in. The world that Robson has created is interesting, but it doesn’t feel fleshed out. More, we get glimpses of what happened to make the world what it is, of how people live in their new reality, and of the exoticness of the world. For example, the main character Minh has robotic octopus-like legs, but her back story is only barely touched on. Most frustrating to me, however, is that the book ends when it just gets going. The whole book feels like a set up for the main event, but the main event fizzles out and doesn’t really deliver. I have to admit that I might be interested in reading a follow-on story, but not if it had the same pace as this one. The characters are developed, but the setting and the story are not as much. The ending felt like a let down. While I find the world intriguing, it isn’t worth investing so much for so little gain, in my view.